Meet Evan our new Account Manager. Evan previously worked as a Business Admin Apprentice for Northumberland County Council after leaving school and then went to college to gain additional qualifications. 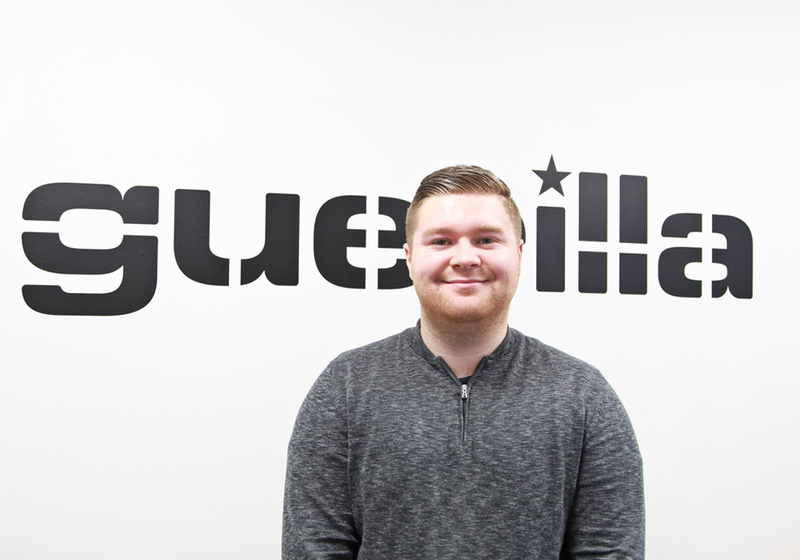 Prior to joining Guerilla he worked as a Client Services Executive for 3 years before becoming a Business Development Executive over the last 12 months. At the age of only 22, Evan has a great head start in the industry and we know he’s going to be a valuable asset to the Guerilla team already (and not just because he brings in flapjacks for the team). When he’s not in the office, you’ll struggle to keep this sport fanatic off the golf course. I am a level four referee so officiate in The Northern League. To be able to fly. Who is your favourite artist/musician? Robbie Williams has to be an all time favourite. Where is your go-to spot to grab a bite to eat? What made you join the Guerilla team? I joined Guerilla to develop my career and to embark on exciting new opportunities. I aim to expand my skill set and fully embrace new challenges.